“We feel we possibly located wreckage on the sea floor,” East Hampton Town Police Chief Michael Sarlo said. 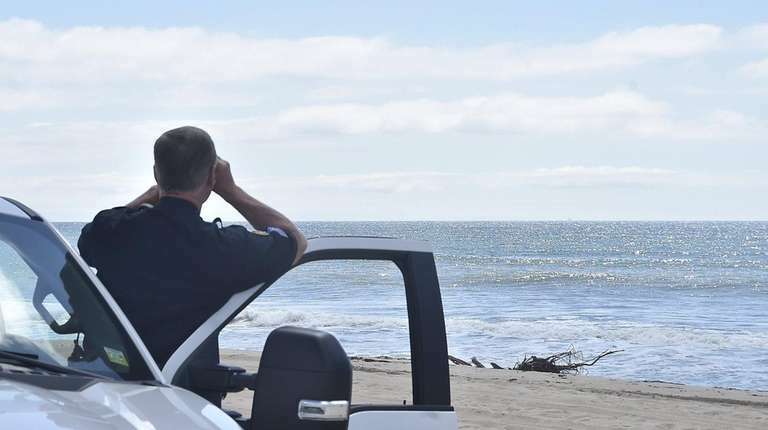 Patrols and divers will return to the waters off Amagansett Thursday. The search for two of the four people aboard a small aircraft when it crashed over the weekend off Amagansett may finally have shown progress Wednesday, East Hampton Town Police Chief Michael Sarlo said. Four divers and two patrol boats with sonar equipment spent part of Wednesday back on the ocean — the fourth day search teams looked for the victims after the twin-engine Piper PA-31 Navajo hit the water Saturday afternoon about two miles off Indian Wells Beach. Despite murky conditions underwater that limited the divers’ search, Sarlo said the could be closer to finding what remains of the aircraft. “We feel we possibly located wreckage on the sea floor, however divers were not able to get a visual on it today due to visibility,” Sarlo said in an email Wednesday night. He said patrols and divers will return to the water Thursday. Thunderstorms, strong winds, and choppy seas with waves between 4 and 8 feet have hampered efforts to located the two people. Two bodies were recovered Saturday. A memorial service for the Krupinskis and their grandson is scheduled from 4 to 8 p.m. Thursday at Yardley and Pino Funeral Home in East Hampton. A funeral for the three is set for 10 a.m. Friday, at First Presbyterian Church of East Hampton, followed by burial at Cedar Lawn Cemetery, also in East Hampton. Information about services for Dollard was not available.